The parts for the cooling system restoration have arrived. 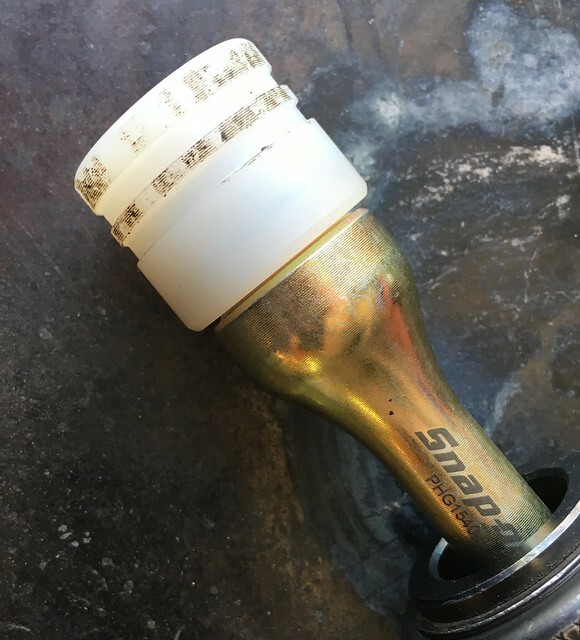 I’ve got an unexpected seized/stripped bolt head. 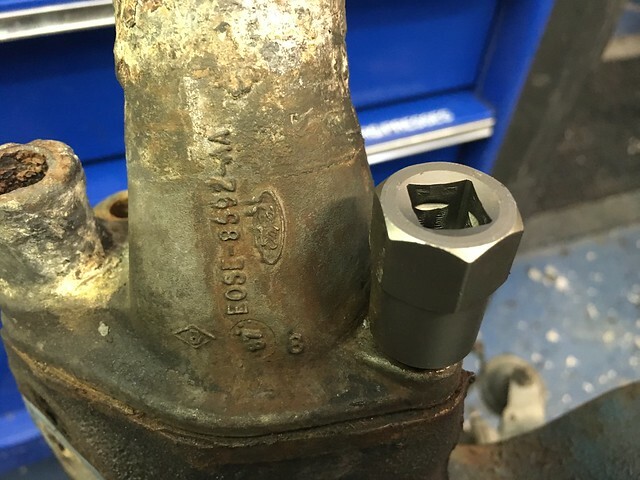 Though I suppose most stripped bolt heads are unexpected. I tried everything, crowfoot, box, open end, flare nut. It’s the bolt that attaches the thermostat/outlet to the intake manifold so it’s somewhat of a bear to get to. So off comes the manifold. I’d forgotten how heavy a cast iron intake was. 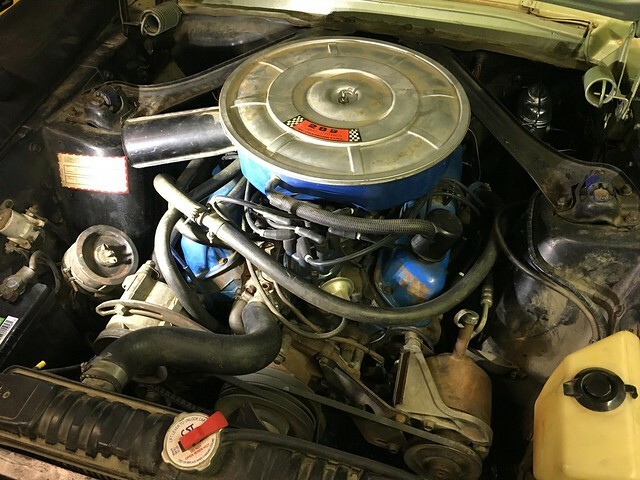 The valley looks pretty good for a 50 + year old car. It’s been off at least once before when the heads had new seats installed in the 90s. There are some powdered oil clumps in a could of places but otherwise it looks good. There are still some water jacket blockages but mostly they’re clean or at least clean enough to use. It needs a cleaning/buffing of the intake port face on the head to knock off the kack and left over gasket chunks. I’ll block those ports with a rag while I’m doing it then vacuum out the bits. 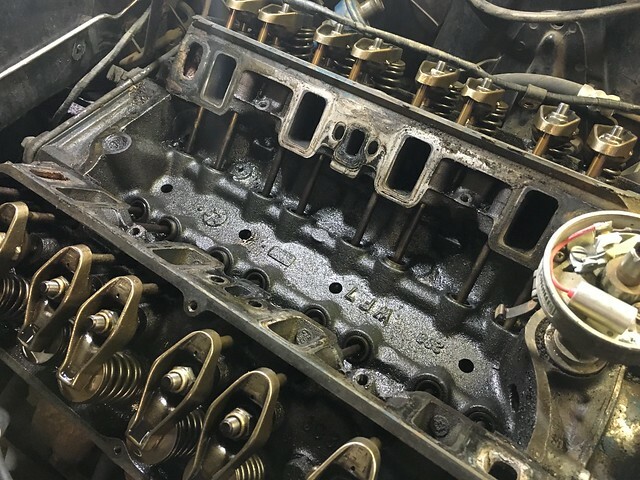 Though it all looks good I’ll bust into the short block once I get some more done on the car and I’m able to have some fun driving it over the summer. I’ll make it part of the engine bay rehab project after steering and suspension. 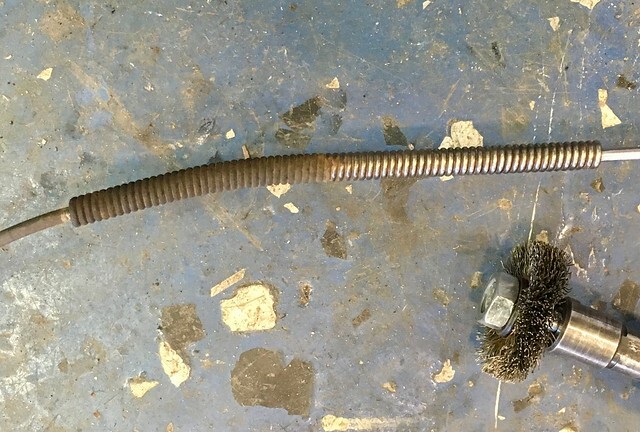 Here’s this seized bolt with a stripped head. The paint pen mark was when I was trying to turn it to see if was turning or if I was stripping it. I was stripping it. 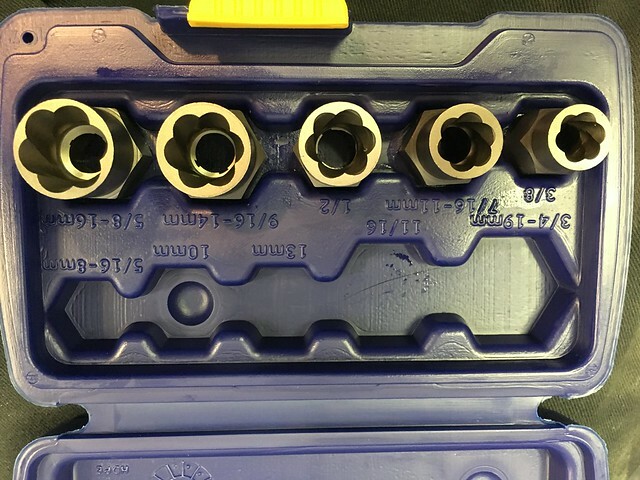 I picked up a set of Irwin stripped bolt removal sockets. About $30. 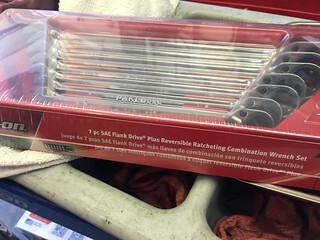 I’ve got other stripped fastener removal tools but didn’t have these though have used them before. If you’ve not used them they have flutes cut into the socket that grab when you turn it the direction to loosen it. You set the socket with a couple of light raps with a hammer. Then spin it off as you would normally. 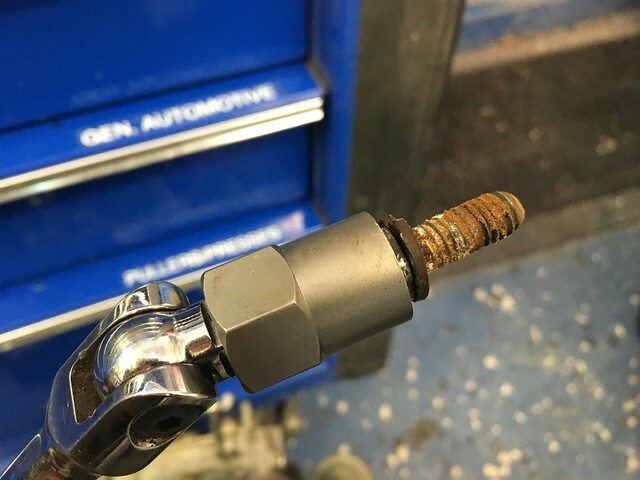 I used a breaker bar but you can use a ratchet or impact. If all goes well I should have it back together tomorrow afternoon sometime. I was hoping to get into the steering and suspension but doesn’t matter how it steers or handles if it won’t stay cool. 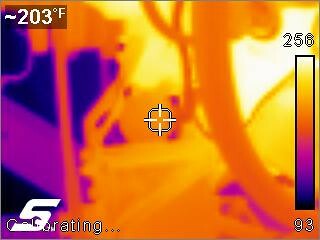 First some basic cooling system troubleshooting. The system looks pretty hammered from the outside. First step is to run the car a few miles prior to overheating. You can tell because the engine starts to sputter during a stopped idle then carry on more or less normally once the car is in motion. 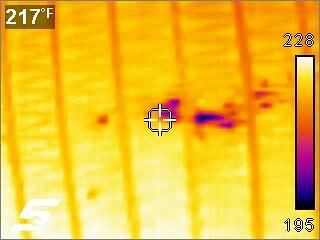 First order of business is to get some thermal images. Have a look-see at the fuel pump at temp. I’d boiled the fuel but didn’t overheat the engine when the car stranded me. Let’s see how hot it’s getting compared to other parts. Not bad but let’s look and make sure the radiator is flowing. Those dark spots indicate an obstruction. They show up as lower temperature because the coolant isn’t getting there. There are a few of them but not so many that it’s a major problem. Yet. Let’s check out the front of the intake manifold. 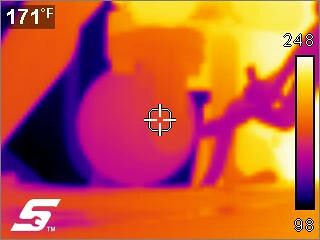 It’s getting a little hot at the thermostat housing/outlet. We’re going to want to look into that a bit more. Check out about 5 o’clock from the center target position. It’s reading a good bit hotter than the rest. Could be an obstruction. Here’s another shot. The difference is even more pronounced toward the bypass. I’m wondering if that thermostat is working at all. 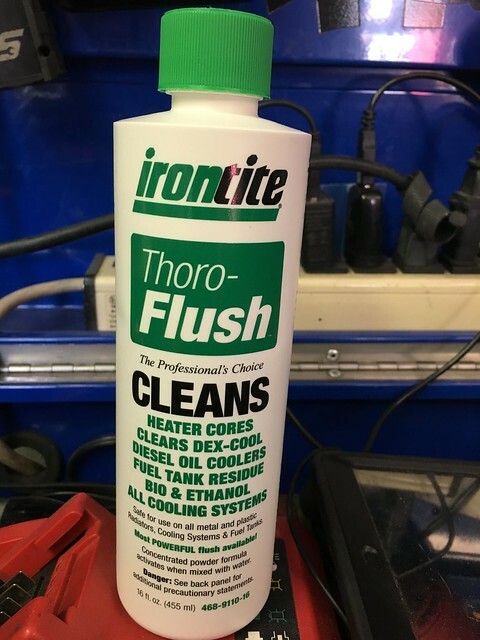 I’m going to flush it with something I haven’t used before but diesel guys swear by. I gave the thermostat a test and it’s dead as a doornail. Rolling boil no open on a 180* thermostat. 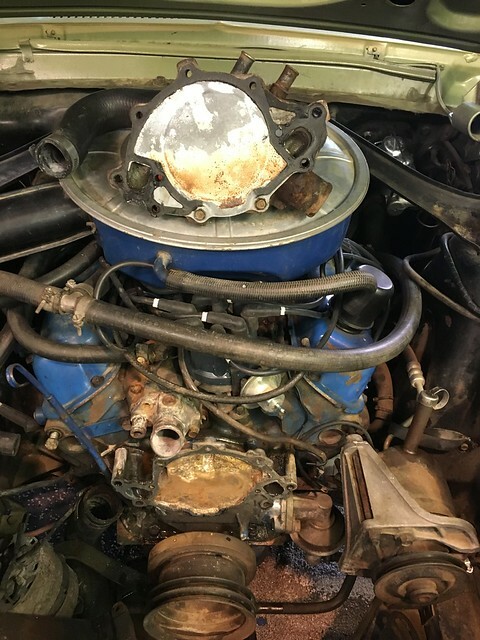 The flush went well, there was plenty of rust in there. Hopefully I got enough out that I can wait to tear into the block. 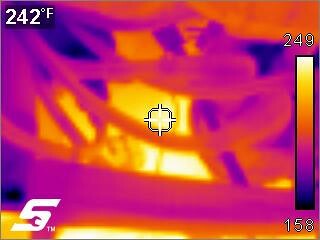 I didn’t save any thermal imaging after the flush but the gauge regeistered cooler and the heat signatures were more uniform particularly at the manifold outlet and top radiator hose. Time to tear into it. I want to leave it in enough to fix this so I can drive it while I’m working on and diagnosing other issues. Otherwise I’d just stab it out and tear it down. 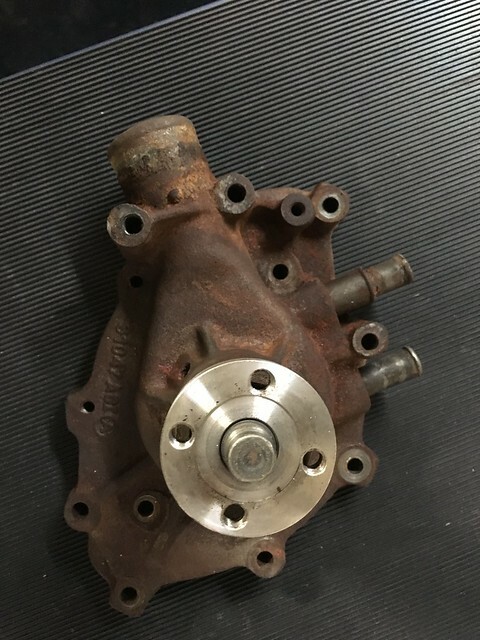 I’m expecting the worst from the water pump. What I could see with the borescope didn’t look good. 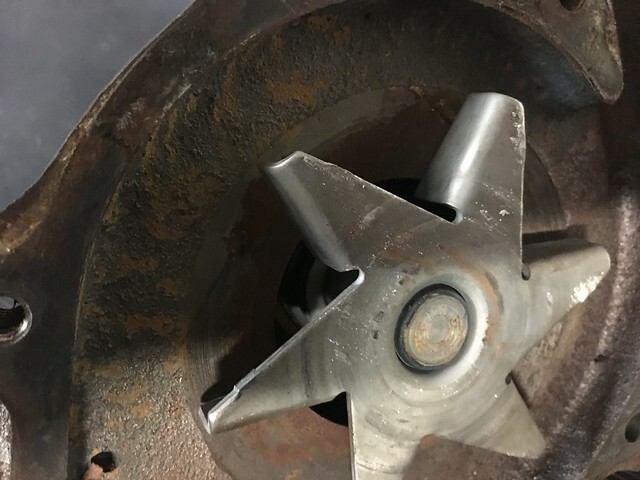 Fortunately that was the edge of a casting and not the impeller. I was almost shocked when I popped if off and found this. Looks like someone rebuilt an existing core. I couldn’t find the casting number in the Ford interchange so I’d reckon it’s an aftermarket casting with new guts. We’re on hold for a few days waiting for parts, mainly gaskets, thermostat, cap and shroud. I’ll put it back together and run some more tests. I’m also going to install a real temp gauge and sender using the plug hole on the manifold outlet. It’s back on the road but still some work to do. I’ve got about 50 miles on it since the resurrection. Until it crapped out, coincidently in a Pep Boys parking lot but not the Pep Boys by the house. For this build I’m not using chain store parts but for fluids and such they’re great. 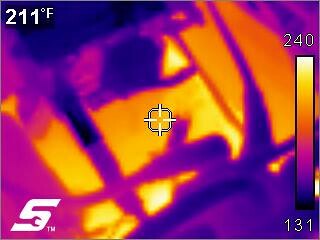 Appears to be a fuel/heatsink/vapor lock issue. I put the road service we got from Hagerty to good use. I got it back, cooled it off, primed the carb and it’s back running. I’m taking some heat signatures in various states. It’s fully into summer here. It was about 105* when it conked out. Timing is good, dead nuts on. Idle is a bit rough at times. I got a VIN check at the DMV to change the title and register. They didn’t like where the title release was signed (even though it’s where CA says it should be…) but I got a movement permit for a month anyway. There is so much made here at VMF about the fender tag vs. door tag as the legal point of reference. As I pulled into the VIN inspection area I got out and went to open the hood. The inspector asked if I was having a mechanical issue. I said no that I was just opening the hood so she could see the fender stamp. She said NV recognizes the door tag as the legal VIN and use that for the check. I mentioned the Ford says the door tag isn’t the legal VIN. She chuckled and replied that Ford doesn’t get to decide what the state of Nevada uses to determine the correct VIN. She disappears with the pink slip and a couple of minutes later returns with the full registration history from California, decoded VIN and a pretty good description of what the car had when sold including the original purchase price. The engine as a survivor buttoned up with a fully plumbed smog pump. The car is in great shape. Needs some mechanical love and some aesthetic bits. If you look close you can tell the work was done over the years by two chain collision shops. I’ve got the original hub caps (those are the original steel wheels as well) but haven’t put them back on yet. Dash is good, pad is great. I’ve got new plastics and bezels and will install them after more of the mechanical is complete. I’ve also got door cards and a few other bits. Carpet is new but black so I’ve got to see what was originally in the car. My wife is riding herd on the interior including new heat/noise insulation and is working on other mechanical bits with me as well. 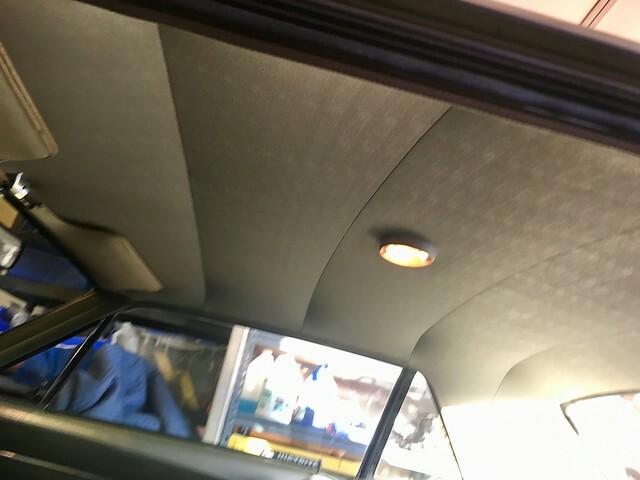 Original headliner, still in fantastic shape. 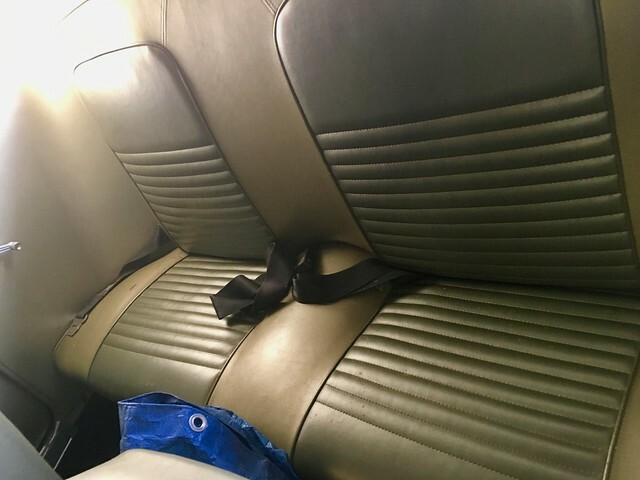 Rear seat is original, not too many people rode back there. The fronts were recovered about 20 years ago to new, stock condition and color. It’s a hoot to drive though more than 50 mph or so there is quite a bit of skating in the front end. 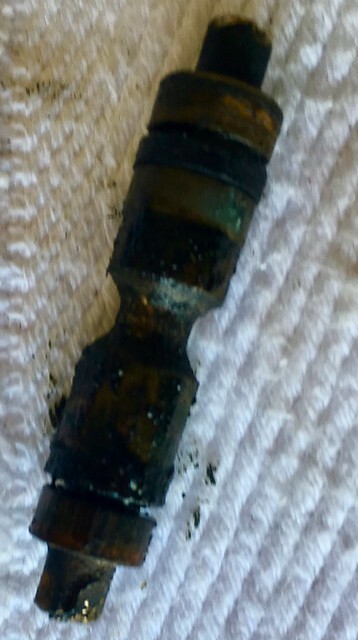 Some of it is the 50 + year old Bendix style power steering. The alignment is whack though it doesn’t look like bent parts but I’ll know when I take them off to measure them. I’ve got all the seals and new idler for a steering rebuild. Asked Choko about a kit but he was on vacation and I wanted them before he got back. About $140 for the parts. Hopefully the tie rod ball joints are still usable. I’ll test them and see. Haven’t yet made a bushing list but they’re well rotted, or “perished” as Edd China would say. Before I tackle the steering I want to make sure I have this heat issue sorted. I’m also going to send an oil sample to Blackstone to be analyzed. The reports are fantastic. I wanted to get 100 miles or so on it then change oil, send the sample and cut the filter open to see what is inside it. If it checks out I’ll not pop it open just yet but clean it, paint it and use it. It’s that time of year where it’s getting hot. We’ve been kissing just below 100* outside making it just a bit warmer in the shop. It’s past the time I can paint and do body work (the catalysts don’t work properly at our summer temps). Paint and body are a long way away and I’ll have two collision shop jobs to tweak on. One not so bad, the other a disaster of a rear quarter repair. Looks good from far. But far from good. Finishing up on the brake system refresh it’s pretty clear that the fluid had set for a long time. 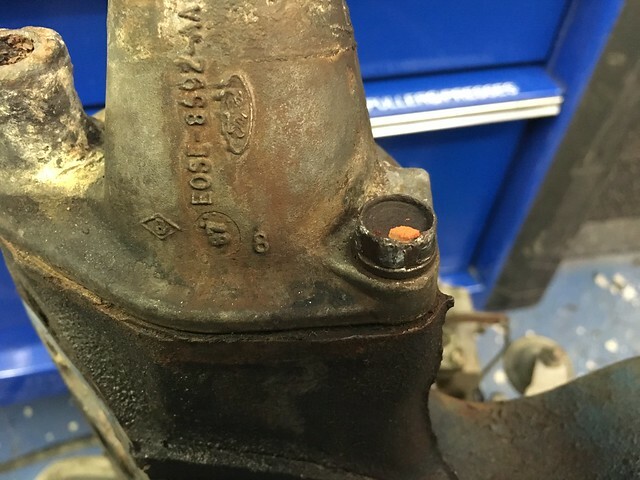 The chunks in the bottom of the large chamber on the master cylinder are coagulated brake fluid. That would be the chamber for front disc brakes. 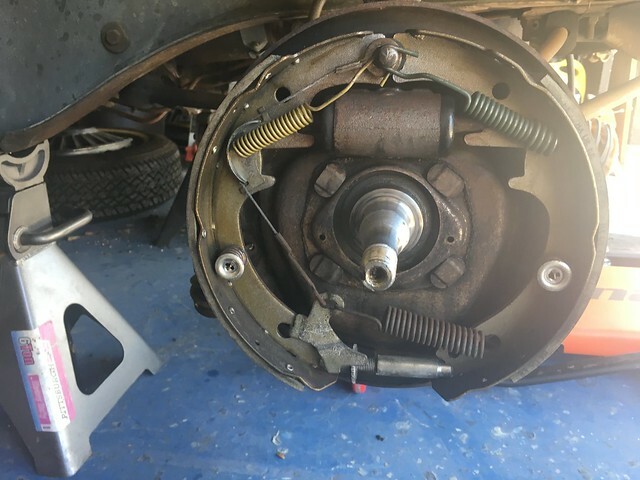 This is an all drum brake car. A new Cardone from CJ and all is well. The hardest part of the job is contorting under the dash. Looks like a dash creeper is in the cards for me. This was the first of many, many times I’ll need to be under the dash. I’ll likely spring for a standard Whiteside instead of the tool truck designed and branded unit. My understanding is Whiteside makes the version for the tool truck. 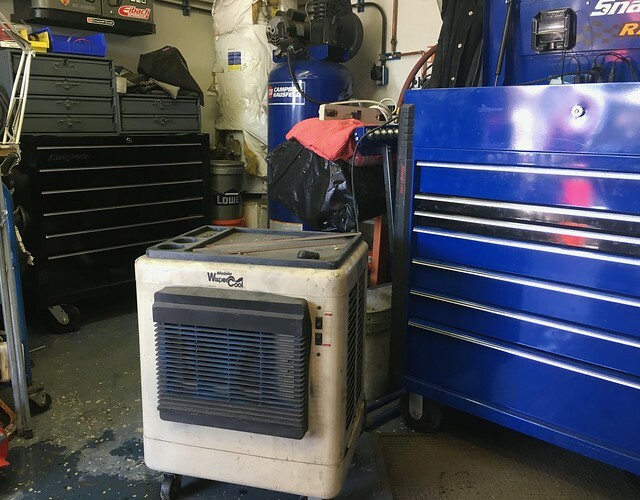 The tool truck version can go to 30″, the standard is 24″. The difference in price is almost $200. All of the lines and interconnections have been flushed cleaned and reassembled. The lines held up surprisingly well over the years. 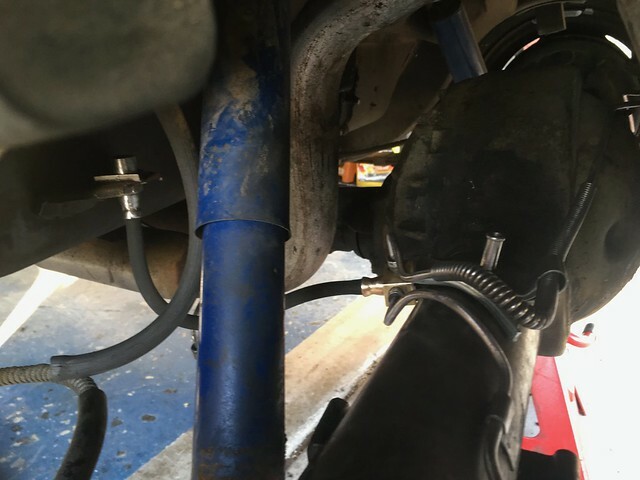 The only pitting of note was where the rear main tube turned up into the engine compartment and in the rear from the junction to the left side wheel. Other than that no kinks, creases or crushed lines. The sprials on the rear lines need a bit different media to clean them, one where the profile is vertical to the rotation to fit into the nooks and crannies without taking to much of the base away. They make a Sctochbrite bristle in that config but I don’t have any. By the time I got to it there was only an hour or so left to get to the local industrial hardware before the holiday weekend. And it’s packed here on Memorial Day weekend. If it wasn’t packed here we’d starve and I wouldn’t be able to have such an expensive, time consuming hobby. 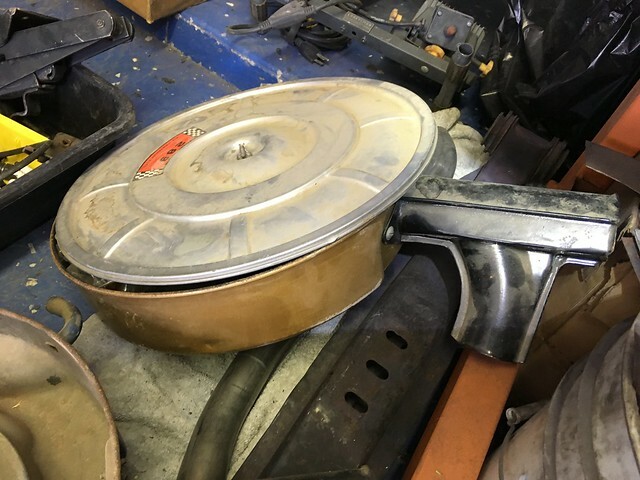 I have some 2″ wire wheel discs that worked great on the line covers. Here is the rear, cleaned, flushed and back together. Everything is ready to go except the pressure differential valve/piping manifold. 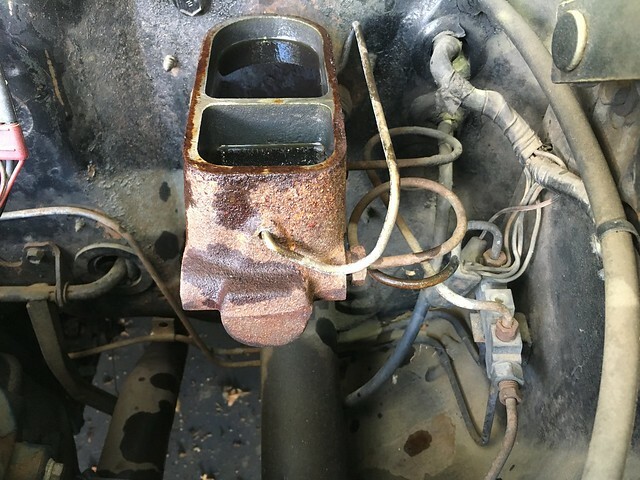 It’s the brass block next to the master cylinder that distributes the fluid and alerts to changes in pressure on either side that could indicate failure. It’s a mechanical switch that triggers an idiot light. Whomever did the last brake job apparently broke it and the switch port has been open for who knows how long. At least 11 years at this point. Best I can tell that particular single conductor switch and the housing were used only in the 67 model with later years using a different two conductor until ’79 or so according to parts references. 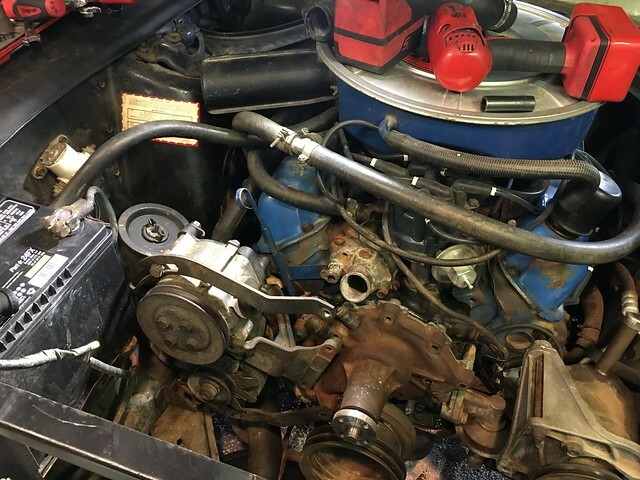 I couldn’t find any NOS or used switch blocks/manifold and only a couple switches correct for 67. 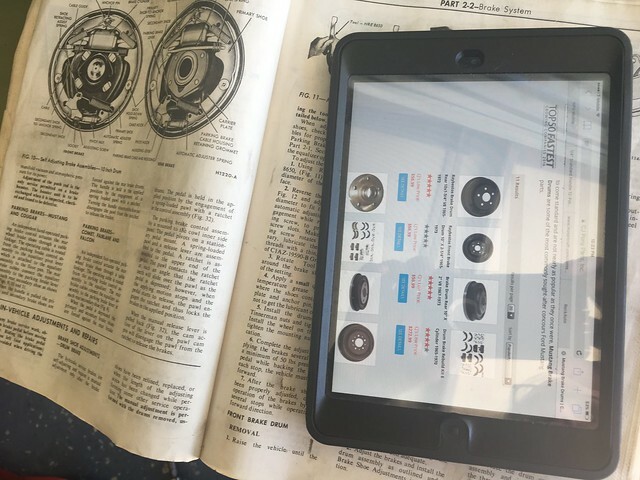 You can make other years work or use fittings for distribution and forgo the warning light (if you can’t tell half your brakes have failed you shouldn’t be driving…). The goal here is a historically correct representation of the car as it would have been a year or two after it was purchased. They won’t pick me for Pebble, I’m not going to show at an MCA and Carini isn’t going to show up at my barn. Mostly because I don’t have a barn and I don’t think he likes America muscle cars anyway. That means rebuild the switch block. First up, get it out of the car. Easy enough. Next remove the plastic threads that were broken inside the block by scoring the edges of the plastic with a small chisel and using a large tip slotted screwdriver to turn it out. The plunger that activates the switch is stuck. I mean stuck. First I plug all the openings except on to inject air, 150 psi, into the housing to dislodge it. Not even close. 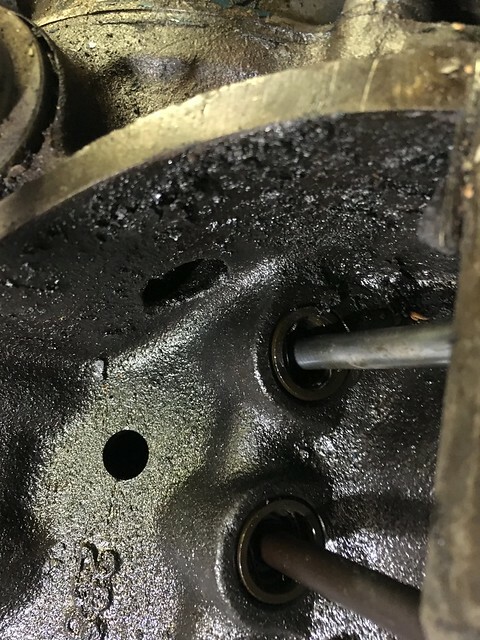 The air whistled right past the seals on the stuck piston. Now on to plan B. If at first you don’t succeed try again. With a bigger hammer. I got out the air hammer and the new nylon tips I got not too long ago. This is a tool truck only thing as far as I can tell. The hammer bit uses interchangeable tips. They can be this plastic sort of nylon, steel or aluminum. I use them on the fabrication side to planish bodywork and like shaping or if I just need to hammer the heck out of something. No go. Even after a few tries. Someone here at VMF suggested to someone else in another thread from long ago to drill it out. I can’t use it as is and if it’s stuck and I break it so what. So on to the drilling portion of the job. I got a drill size just a shade bigger than my skinniest pin punch, 3/32 or so, diagonaled the center of the block, chucked it in the drill press and went to town. I give it a light but firm whack with the pin punch and a 16 oz ball peen dead blow. No move. Next a more decided whack with that same punch and a 24 oz straight ball peen. 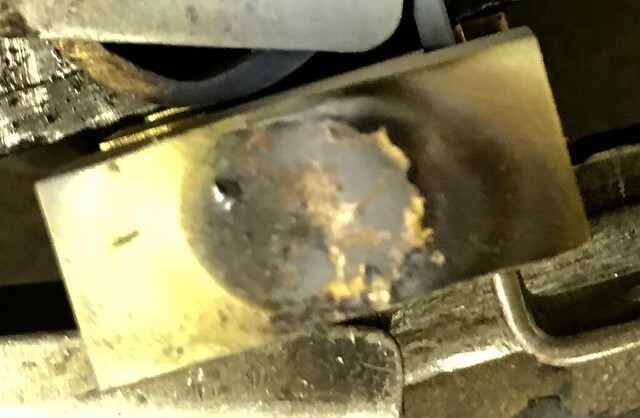 It took another almost robust shot to get the piston/pin out. It was cooked. 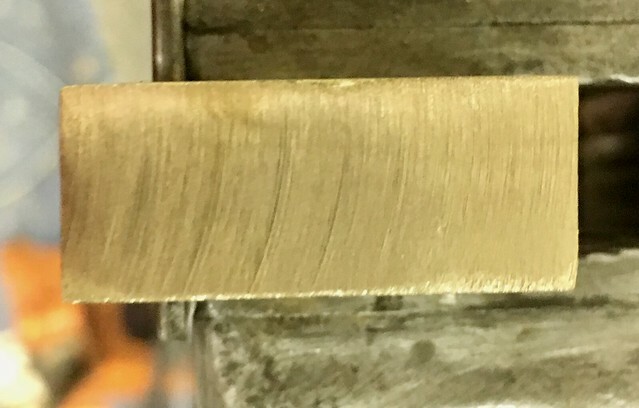 The scars on the bottom of the piston are the punch marks from knocking it out. A rebuild kit from NPD with the screw in stud to hold it in place while bleeding and we’re good to go. Except for that hole in the end of the block. With some tips from Welding Web and Jody at Welding Tips and Tricks on You Tube I figured that I’d need to use either aluminum bronze or silicon bronze as the filler metal. Like AL it will be hard to heat at first but once it is it will flow like a demon. I did a test run at 80 amps on some flat steel stock and the filler. Seemed OK. I was using lanthanated tungsten, argon and AC voltage on the welder. An 80 amp pass wasn’t going to cut it. I tired a few more then pre heated the block for a few mins with a mapp gas torch. I then hit it with 150 amps and presto, it worked. It’s an ugly bead, that’s the nature of brass and it gasses off something fierce. But it works. It will need some refinishing to bring it to a good look. I used 80 grit Roloc flap to knock the big chunks back and finished it with maroon Scotchbrite. I’ve still got some cleanup to do in the block. There is a small nub that hangs down from the repair into the cavity. Probably won’t impact performance but I’ll grind it out with a ball cutting end mill then finish the cylinder cavity with 1000 grit around a drill almost the size of the bore. It will be like honing it. 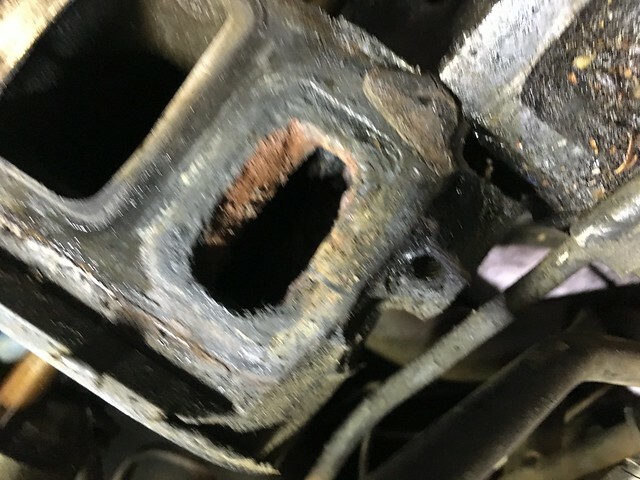 Between sticking the piston in there and the gassing out of the piece during the repair I’m sure it could use a good resurfacing. If all goes well I should have a refurbished brake system on the car sometime Memorial Day. The revamp of the ignition and cleaning of the tank got it back on the road. The tank came out better than I expected. With a bit more work I could coat it and use it. After soaking in my mixture for a couple of days, draining then letting it sit outside for a couple of almost 100* days the remaining gunk balled up and was able to be vacuumed from the tank. Other than the lifter it runs fairly well. Could use a carb tweak here and there but not bad for spraying with carb cleaner after 11 years and cleaning out the fuel system. Refurbed the accelerator linkage with new parts as well as the kick down. Got the Mannel engine book for the historical perspective to get it back to having the correct parts. Started collecting original parts for the A/C. Can’t really enjoy a car too much in the summer here without A/C. Rather than put a Classic Air or like system in I’ve decided to get the stock parts and refurb them or get repros. I’ve got the entire blower assembly. Works great, a little worn looking but after 50 plus year not too bad considering. Just like it’s owner. Next will be the hunt for the heater box/evaporator assembly then the condenser and pump. A/C won’t be done for this summer. Too much basic mechanical for reliability before I start that. The initial plan was to get the brakes working well enough to get on the road. 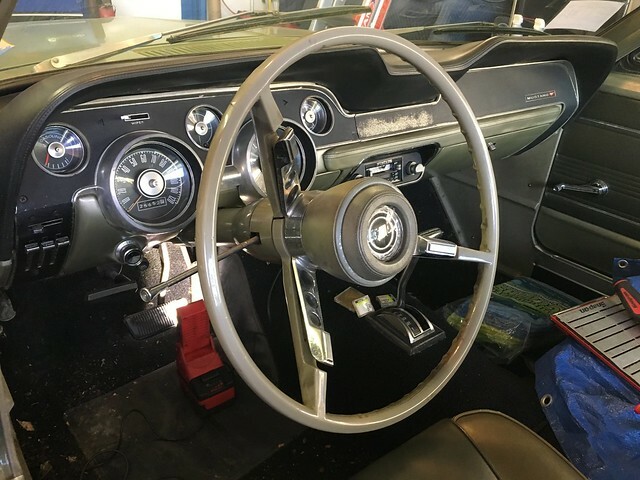 Once I got into it and saw that it didn’t have the correct master cylinder for manual drum/drum and the condition of some of the lines and the pressure differential I’ve made another “while I’m here” decisions. It’s also the first “wow those are hard to get and expensive” moments. 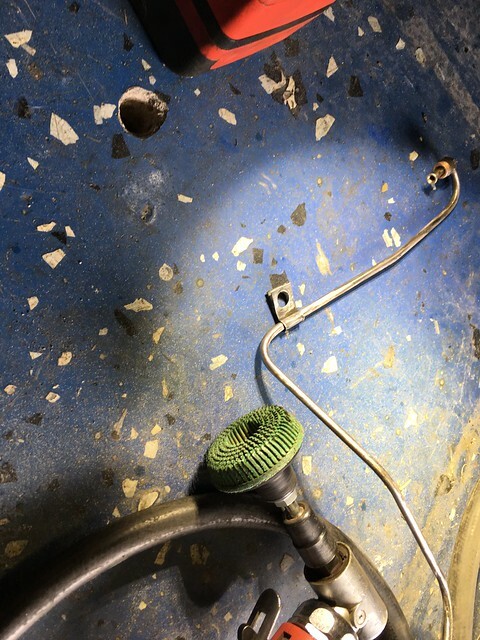 The pressure differential switch was broken off. It’s the 67 single pin switch. Looks like that’s the only year they used that particular switch. NOS is $125 and reconditioned is $45. If you can find them. I’ve found one of each. 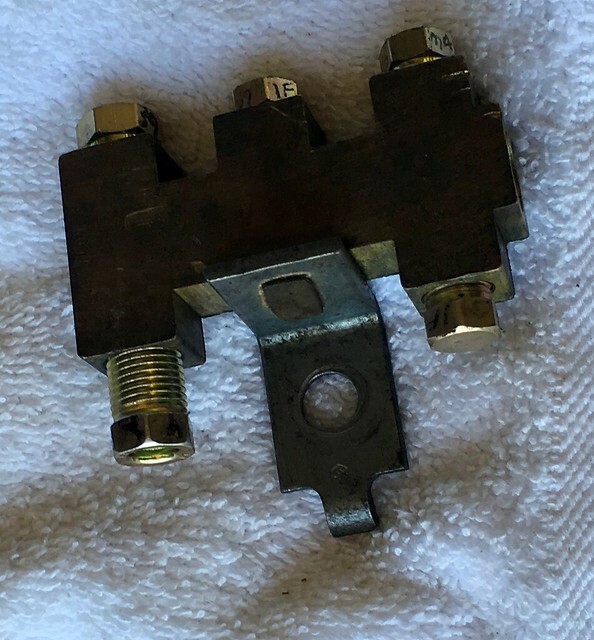 The manifold/distribution block for the pressure differential switch needs a rebuild as well. Those parts are easy to find, two seals and a crush washer. 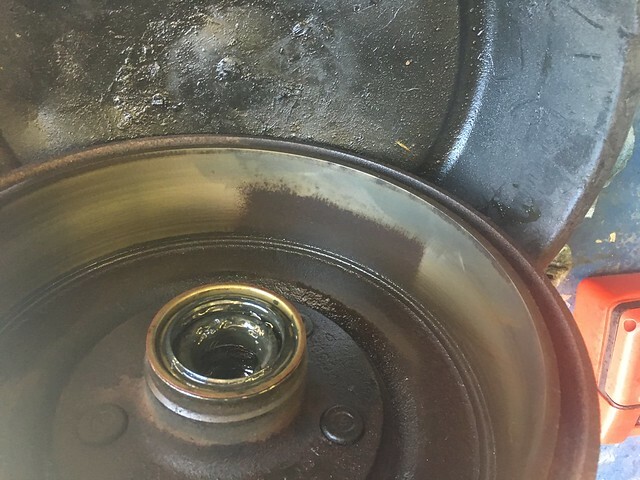 The piston is stuck toward the inside. I’m going to make an air fitting and plug the other holes and see if I can blow it out. It’s soaking in Berryman’s right now trying to loosen it up. 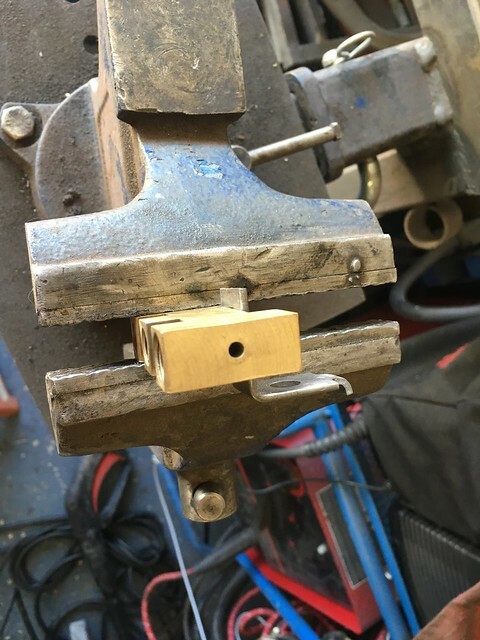 Otherwise it’s drill a hole, use a pin punch to get it out and fill the hole by TIG welding the brass and resurfacing that side of the manifold. Got a choice of air cleaner assemblies. The standard corporate blue and another that’s gold with a 289 4v sticker. I’m not sure the gold one is a 67, looks like it could be more like a 65 with a repro decal. My understanding is that after 65 the engine colors were standardized. Either way I’ll get the one that fits the year and paint it the appropriate color. The gold one has a new air filter and either a repro or NOS breather with the decal stashed inside the assembly. The front drums had rust in what looked like either water collecting or it was up that far in snow each winter for a decade. It was in a garage that was more like a carport to conform to the association’s rules. It was in the sticks but they still had an HOA. Based on some of the other rust at that level particularly the front valence that it sat in snow for a while. Each year. I used some Scotchbrite to see if the worst of it was pitted too bad to turn. It wasn’t bad. My engine machine shop doesn’t do brake drums/rotors and recommended the local driveline/rear end shop. Didn’t know they did brakes. They did a fantastic job, $39 for both. I’ve started refurbing the lines (should have the other parts in a few days). I use Scotchbrite bristle Roloc on a 90* air die grinder to knock the big hunks off. Then I use Scotchbrite maroon and brake clean to finish it off. The insides are blown clean with my tank gunk mix and air. I check the pressure to make sure it’s not clogged by putting 10 psi into the line and reading what comes out the other end. Old school meets new school. I’ve been using a computer in the shop for the last 8-9 years. The last two builds I did and the daily I service didn’t/don’t have paper manuals at all. Here’s what the front suspension looks like now. After brakes it will be the steering. I’ll drive it enough to get it registered then start in on the front suspension refurb. It will be a big one. Ball joints, bushings, knocking the gack off. I’m going to do my own roller spring perches. That’s the kind of thing we do on race builds. I’ll do the Arning drop and get a 1″ bar. Other than that I won’t do too much except for shocks.